Let’s be frank, understanding conversion tracking and attribution is a bit more complex than most people anticipate. Conversions take place after a marketing goal has been completed. So if we think of a goal completion as shooting the ball through the hoop, then conversions are like instructing the players to score more points. 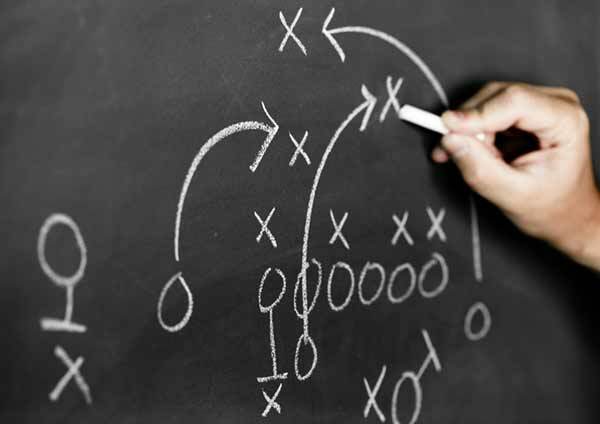 It’s critical to have layered strategies in place to ensure goals may be reached. There are attribution models, offline conversions, cookies, goals, tags, pixels, and time frames– the list goes on and on. This can be very overwhelming to marketers tasked with managing the data and using it to properly fuel marketing campaigns. Website is probably the most common type, tracking form submissions and shopping cart activity, so we will use that for our example. Once you select the Website conversion type, you’ll be offered additional options to customize reporting. 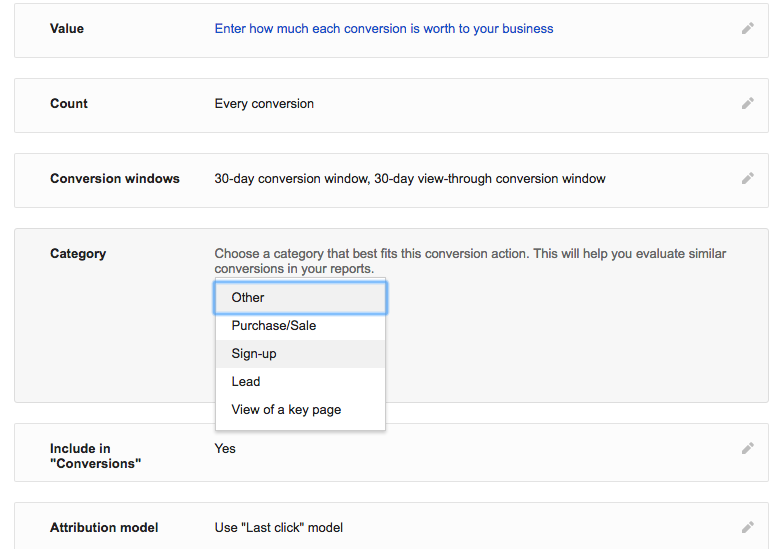 These options allow you to assign a value for the conversion and select how often you want the conversion to count. For example, if you’re tracking phone calls as conversions, you’ll probably only want to count the first call as a conversion and not each repeat call. You can also categorize the Lead Type which provides insight on the campaigns and keywords that are bringing in the most leads vs. sales. This becomes very beneficial for reporting. Next, you’ll need to install the AdWords Conversion Tracking Pixel on the page where the conversion will take place. Typically, this is the thank you page or confirmation page for downloads and purchases. Now that we understand the different conversion types, it’s critical to understand how and when Google AdWords will count a click as a conversion. First, there’s the Google Conversions Pixel. When a website visitor hits a page with the embedded code, the pixel notifies the AdWords account that a conversion requirement has been met. However, the pixel isn’t what makes the match between the paid click and the conversion– the pixel is simply a trigger. This is accomplished through the combination of cookies and auto-tagging. Auto-tagging is a feature inside of AdWords that acts as a receipt for paid clicks. When auto-tagging is enabled, it will automatically tag the URL of a paid click with a gclid= (google paid click identifier) followed by a string of numbers and letters. This allows Google to use the gclid in the URL as a way to bridge the gap and map the original paid click to the end point as a conversion. CallTrackingMetrics uses auto-tagging as a way to identify Google paid traffic. When there’s a gclid= in the landing page URL, it triggers CTM to dynamically display a tracking number designated for Google AdWords website visitors. In AdWords conversion configuration, there’s an option to set a conversion window which is typically set to a 30-day cookie. The cookie will then store the gclid information and attribute a conversion to any click that happened up to 30 days prior to the conversion action. Note: Google AdWords attributes a conversion to the date the click took place, not the date the conversion action took place. Meaning, if someone clicks your ad on the 1st of the month and completes the conversion action on the 14th, AdWords will attribute the conversion to the 1st not the 14th. Auto-tagging opens up the opportunity to upload offline conversions into AdWords directly, or from Analytics as goal completions, or even from third-party services like Salesforce and Marketo. To track offline conversions, you’ll save the gclid along with whatever lead information you collect from the individual who clicked your ad. CallTrackingMetrics tracking code acts similarly to the analytics tracking code, by tracking the various actions made by website visitors and the journey they take on your website. When CTM matches the caller to the website visitor it also captures the gclid= from the url of a caller. After the call is completed, CTM triggers an Event into Google Analytics with the various information about the callers website session, including the gclid. Note: IF the Analytics property is connected to AdWords AND the same Analytics tracking code is also tracking the paid session, Analytics will match the call event to the paid website session and pass the paid campaign information to CTM. Analytics also has the ability to send the call events into AdWords as a conversion by providing the gclid tag attached to an imported goal completion. Note: You can only import a conversion into Google AdWords if there is a GCLID. If there isn’t a GCLID in the URL Google AdWords will deny the conversion import, even if the source and medium are Google/CPC. If you have opted not to use auto-tagging for your conversion tracking, you’re limiting your conversion tracking to solely AdWords, which means you lose the ability to import conversions from Analytics and other third-party services. Conversions will only be determined by Google AdWords cookies and the conversion pixel. Google Analytics acts as the middleman, passing information from CTM into AdWords and back from AdWords into CTM. CTM sends the call data into Analytics as Events and attaches all the session data to the event. Analytics allows you to create goals around those events and then import them into AdWords as conversions. More about how CTM sends calls into Analytics. You can import a Goal into AdWords for all inbound calls regardless of the source; Google AdWords, Direct, Facebook, Google Organic, it doesn’t matter. Google AdWords is going to scrub each goal completion to try to identify the gclid. If it finds one, it will try to match it to one in its records. If it doesn’t find a gclid, it will deny the conversion from entering AdWords. Note: If there isn’t a gclid, Google AdWords will not allow imported conversions. Because of this, you cannot import calls from call extensions and click-to-call ads from Analytics into AdWords as conversions. Even though we have a direct integration with Google AdWords and are passing Campaign, AdGroup, and Keyword information into CTM, if it’s missing a gclid, AdWords will dispute this data. 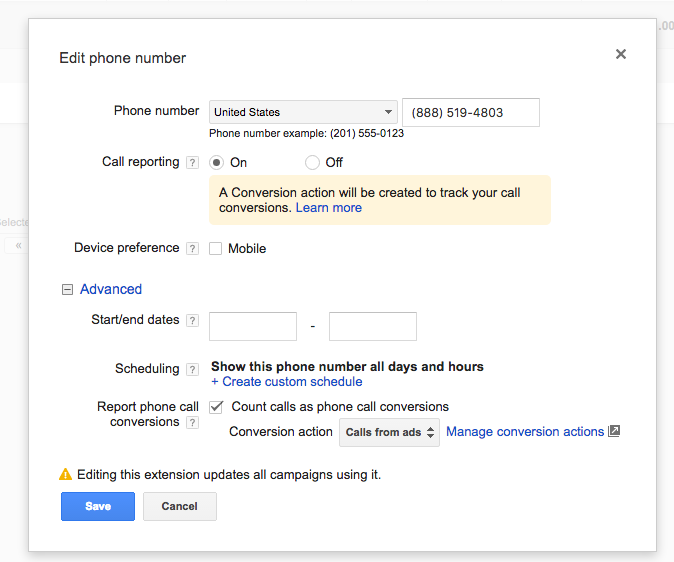 The good news is that you can still have calls generated from your Click-to-Call ads and Call Extensions count as conversions in AdWords. And it’s a direct integration, so you won’t have to rely on a third-party to import the call conversions. More on CTM’s direct integration with AdWords. This option is found inside AdWords under the setup of both the Click-to-Call ads and Ad Extensions. Just expand the Advanced window and check the “count calls as phone call conversions” checkbox. To recap: Google will only count a conversion if they are tracking the call or click. Because of this, you must use the Google Call Reporting and manually enter a CTM Tracking Number as the Receiving Number. This creates a double-forward, allowing both Google and CTM to track the call, resulting in enhanced attribution right down to the keyword searched.